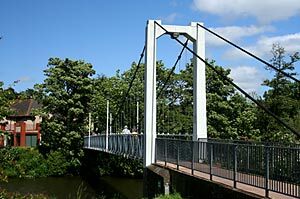 The Match Factory suspension bridge near Trews Weir was constructed in 1935. It was built for Willey's Foundry by the King's Asphalt Company, to provide a crossing for those on the new estates at Burnthouse Lane, to walk to work in their foundry. Corrosion and stress took a toll on the bridge and in 1984 some of the hanger rods fractured and stainless steel replacements inserted. In 1993 most of the trusses, steelwork and decking was replaced, leaving the two towers, cables and anchorages remaining from the original 1935 build. A very pleasant walk from the quay to Trews Weir can become a circuit by crossing this bridge and returning via the Canal Basin at Haven Banks and crossing back over the river via the Cricklepit Suspension Bridge. Expect to get wobbly legs on this bridge as it has a pronounced bounce when people cross - and the designers of the Millennium Bridge in London thought they had invented that little feature! This was not the first bridge at Trews Weir, as a Vestry Minute Book at the Devon Records Office, 1839 to 1904, records a wooden bridge at Trews Weir.